With our ever unpredictable British weather, a garage is really an essential addition for most properties. 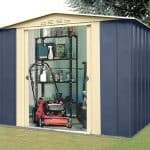 A large garage doesn’t have to come with a large price tag attached however, as this metal garage from Yardmaster shows. Despite being made of metal it’s an attractive building, and will fit in well next to a garden environment. Being made of metal the building is also very tough and low maintenance. The apex roof at the summit carries rainwater quickly away, so you won’t have to worry about your car getting wet whatever the weather outside is doing. 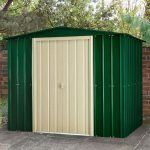 Thanks to the toughness of the galvanised metal used, it also comes with a 10 year manufacturer’s guarantee although we wouldn’t be surprised to see it last even longer without any signs of rust appearing. Once inside the building it’s noticeable just how light the interior is, and that’s thanks to two translucent panels that act as skylights in the roof. 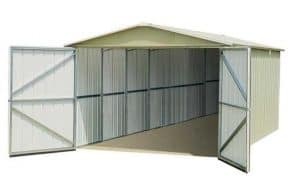 It means that it’s a very pleasant environment to spend time in and so as well as being a well sized garage that can easily accommodate a family car, thus could also be used as a large metal workshop for either business or leisure purposes. This apex roofed metal garage has more than enough room to find even a large family car, but that also opens up further possibilities. It’s size gives it versatility, so that we can easily imagine this being used as a craft workshop or a place to run a home business from. Despite it’s metal nature we feel it has an attractive appearance thanks to its subtle green colour scheme, and we were pleased to find that it was painted inside and out. 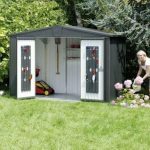 The apex roof gives this building the traditional appeal of a large scale garden shed, but it’s also very effective at carrying rainwater or snow away which can be vital in the fight against rust. The ridge height at its peak is 2.21m and perhaps more importantly the eaves height is 1.80m. The internal width is 2.80m and the internal depth is 5.00m which are the measurements you’ll need to know when deciding if it will be big enough for your vehicle. We were pleased to see that hot dipped galvanised steel had been used for the cladding, as this is a very tough and weather resistant substrate. The zinc which is added to the core steel gives extra rigidity, and the coats of paint which are then applied on top provide an extra layer of protection against the effects of heat and moisture. When assembled it feels very strong and stable, which of course is particularly important in a building of this size. 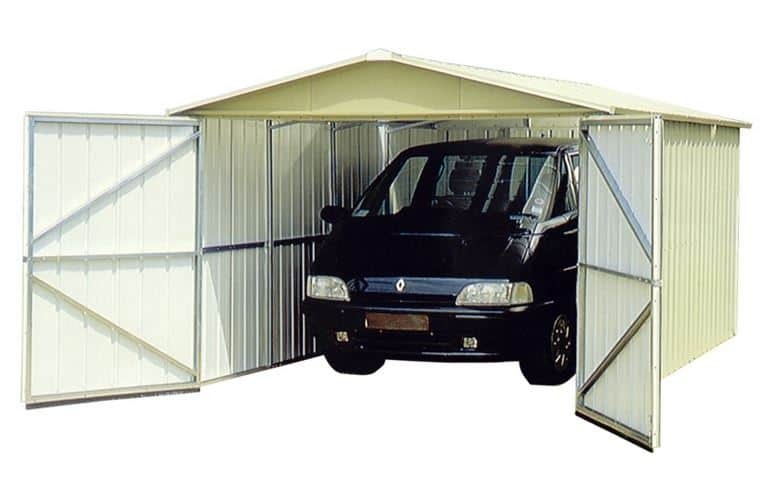 There is no floor included, as garages such as this are designed to be affixed directly onto a level area of suitably sized concrete. 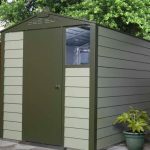 We were pleased to see that the anchor kit necessary to achieve this is included as standard, however, as that isn’t always the case with the sheds, workshops and garages we reviews. As the metal is already immaculately painted there are no treatment requirements to be carried out by the customer, other than routine cleaning and hosing down. Because metal cladding is so durable we would have expected it to come with a long warranty, and so whilst we were pleased to see that the manufacturer has provided a 10 year warranty against perforations caused by rust, at this price we would have expected it to be even longer. With a garage, of course, the doors are all important, which is why we were pleased to see that the double doors on this building create a very generous opening. Made of fully braced steel that feels reassuringly strong when in use, they open to a width of 2.57m and a height of 1.76m. This should make the act of driving most models of car in and out quite easy. We were pleased to see that the interior is filled with natural light on a sunny day, as this adds extra versatility. The inclusion of two translucent roof panels creates an interior environment that could easily be used for work or leisure purposes when a car’s not being stored inside. We feel that skylights, in the form of translucent panels here, are a much better option for a garage than windows as it means that passers by won’t be able to see what kind of vehicle is being kept inside. Further security will need to be added however so it was disappointing to see that although the handles are holed and ready to accept a padlock, it’s left to the customer themselves to find and purchase a lock. 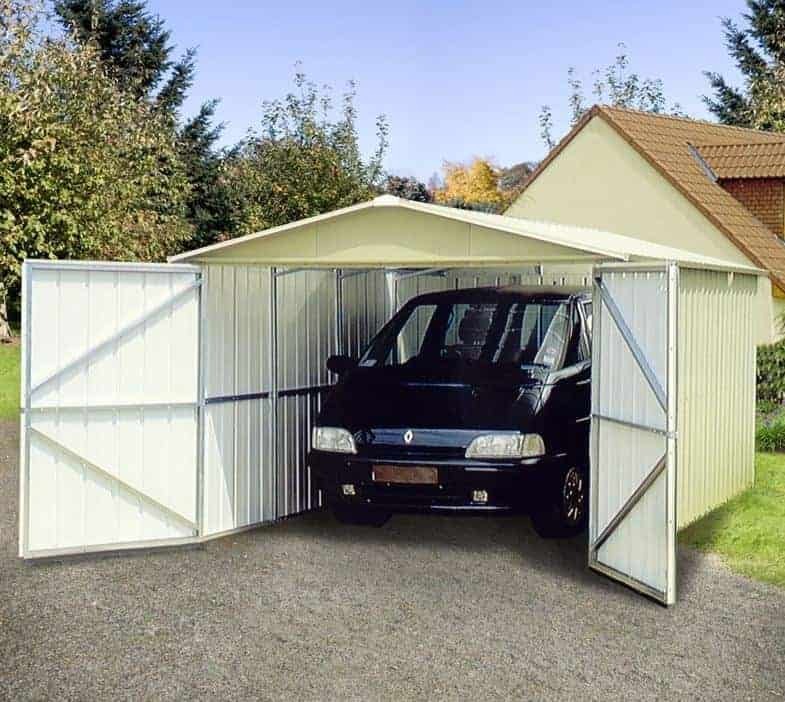 Although there are no optional extras available to buy directly with this metal garage, this in itself shows how much is included as standard. As mentioned above, the one item we feel must be bought before the garage is put into use is a good quality security system. A padlock and alarm can be widely purchased for as little as twenty pounds, and it may be worth adding a CCTV system as well as just the sight of one can act as a useful and effective deterrent. For its size and price, we were impressed by the attention that has been paid to creating a high quality product. Galvanised steel is a tough and durable material, and so we wouldn’t be surprised to see this last for longer than a decade without rust appearing. 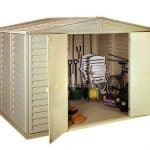 This is a large and deep metal garage, and with the inclusion of two skylights it could also be used as a workshop area. Owing to its size this can be a complicated installation. You’ll need at least one extra pair of hands and you’ll also need to allow at least a full day to complete the assembly. 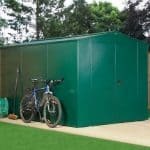 For such a large building, and one that requires no extras to be bought other than a secure locking system, we feel this represents very good value for money. Final Thoughts: Metal garages can represent a very cost effective option for those who need an all weather parking space on their property. 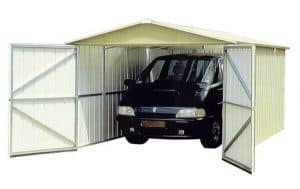 This Yardmaster garage is a perfect example of that, as whilst it’s very affordable it’s also very durable and more than large enough to easily fit all but the biggest cars inside. It can be a little difficult to assemble, so make sure that you have some help and that you read the instructions carefully, but once it’s in place there should be nothing else to worry about for at least ten years. The pale green paintwork is another touch that we liked, as it means that it can blend in well with a garden background.